The "Free Gaza" flotilla was far more than a collection of innocent "peace activists" trying to provide humanitarian aid to Gaza. Most passengers may have been nonviolent -- but a significant minority were anything but. The passengers reportedly included 100-plus members of various Muslim Brotherhood chapters, at least 20 of whom taped al Qaeda-style "martyr" videos before embarking. And the chief organizers clearly had more than "peaceful" intentions for the flotilla. The Middle East Media Research Institute reports that a Gaza-based Hamas leader declared last Friday -- three days before the voyage started -- that the head of the Turkish ship had told him: "We will not allow the Zionists to come near us, and we will wage resistance against them." The morning before the Israelis attempted to board, a Turkish passenger on the lead boat posted on Facebook, "The Turks are prepared with water canons [sic] and slingshots tonight I think all hell will break loose." The radical Islamic Turkish "charity" Insani Yardim Vakfi (IHH) was the chief financier of the fleet. At an April press conference, its chairman, Bulent Yildirim, admitted the real goal: "We are embarking on our journey together with over 1,000 people to break the embargo." The longtime organizer of the blockade-busting effort is a group called Free Gaza. 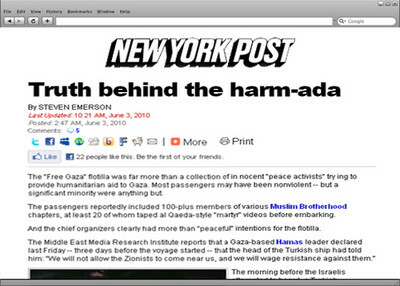 One of its leaders, Huwaida Arraf, made the flotilla's purpose plain at a June 19, 2009, press conference: "It is crucial that we continue sending boats to Gaza to challenge Israel's criminal closure of the strip. Gaza does not need our charity but needs us to stand up against the forces that continue to deliberately deny an entire people their human rights." Arraf is long on record as supporting Palestinian terrorism. In a 2002 article, she urged the Palestinians to incorporate violence in their strategy. The IHH is even less peaceful. A US law-enforcement official stated in a 2003 affidavit that in the trial over the plot to bomb Los Angeles International Airport, French counterterrorist Judge Jean Louis-Brugiere "testified that that the Turkish group IHH had played an 'important role' in the millennium bomb plot." The French magistrate also testified that Yildirim aimed to "recruit veteran soldiers in anticipation of the coming holy war." The IHH is banned in Israel for its association in a radical Islamic conglomerate called the Union of the Good, led by Muslim Brotherhood leader Yousef Al Qardawi, who has issued fatwas calling for the killing of Jews and Americans. Turkey itself arrested members of the IHH in the late '90s for smuggling automatic weapons to terrorist groups. Today, the IHH works very closely with Hamas. This is the true face of those that the world is now lionizing against the "murderous" Israelis. Steven Emerson heads the Investi gative Project on Terrorism (investi gativeproject.org), a counterterro rism organization that tracks the threat of radical Islam on US soil.